» Reviewed by William F. Deeck: LYNN BROCK – The Kink. Reviewed by William F. Deeck: LYNN BROCK – The Kink. LYNN BROCK – The Kink. Harper and Brothers, US, hardcover, 1927. First published in the UK by Collins, hardcover, 1927, as Colonel Gore’s Third Case. Lt.-Col. Wyckham Gore, D.S.O., senior partner of Gore & Talley, Confidential Agents, and his firm have failed to find a missing husband and a missing brother for two clients. One of the missing men turns up In a nursing home, having had, so he says, an accident necessitating the amputation of an arm; he is also missing a significant part of one ear and almost all of his nerve. When the Hon. Mrs. Ronayne, whose name had appeared in connection with both mysterious disappearances, calls upon Gore to begin a constant surveillance of her husband, a famous Irish poet who may be involved with the IRA, but does not say why she wants his movements watched, Gore’s interest is piqued. He is even more intrigued when her father, Lord Haviland, former Prime Minister, asks him to investigate the theft of what would seem to be some fairly insignificant items from his study, with the peer’s daughter and the poet both suspects. As Gore begins his investigation, he meets other members of the family and discovers that they all are more than a bit peculiar, as are some of the servants. Pornographic movies and orgies would seem to be the worst of it, but then someone is brutally murdered. — From The MYSTERY FANcier, Vol. 10, No. 1, Winter 1988. The Deductions of Colonel Gore (n.) Collins 1924; Harper, US, 1925. Colonel Gore’s Second Case (n.) Collins 1925; Harper, US, 1926. 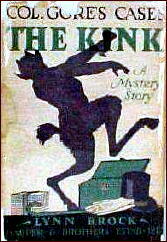 Colonel Gore’s Third Case (n.) Collins 1927; reprinted in the US as The Kink, Harper, 1927. The Slip-Carriage Mystery (n.) Collins 1928; Harper, US, 1928. The Mendip Mystery (n.) Collins 1929; reprinted in the US as Murder at the Inn, Harper, 1929. Q.E.D. (n.) Collins 1930; reprinted in the US as Murder on the Bridge, Harper, 1930. Under his Lynn Brock pen name, Alister McAllister (1877-1943) also wrote three books about Sgt. Venn, none of which have been published in the US, and two stand-alone mysteries. He also wrote two crime novels as by Anthony Wharton. It has its moments, but it is not good enough to recommend. Deeck sums it up well: “a rather complex but not particularly engrossing case”, “Gore is a moderately interesting character”. In the first book, Gore is a purely amateur detective. He starts sleuthing when a friend becomes a suspect in a murder case. It is interesting to read in the above review, that he has become a private investigator. Lynn Brock is not much discussed. My review starts with the only two links I’d found to comments on his work. Of an entirely different personality, yet with dialectic methods broadly akin to Father Brown’s and Dr. Priestley’s, is Colonel Gore in Lynn Brock’s The Deductions of Colonel Gore and Colonel Gore’s Second Case. Colonel Gore, though ponderous and verbose, is well projected, and the crimes he investigates are well worked-out and admirably, if a bit too leisurely, presented. The various characterizations of the minor as well as the major personages of the plots, and the long descriptions of social and topographical details, tend to detract from the problems involved; but the competency of Mr. Brock’s writing carries one along despite one’s occasional impatience.